Since the news that the Air Ambulance has helped to achieve a higher survival rate of patients across the county, Hampshire and Isle of Wight Air Ambulance (HIOWAA) can now reveal that they have reached 6000 missions in the eight years that it has been operating. Over the years of operating, the Air Ambulance has improved its service to members of the public; by carrying blood on board, flying with a doctor led crew and later this year introducing night time operations. These improvements ensure that the patient receives the right care at the scene, and with the Major Trauma Network in place, that high level of care is continued at the hospital and onwards. 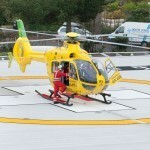 The Air Ambulance will start to operate an enhanced model of the helicopter towards the end of this year, optimized specifically for night operations with crews equipped with night vision goggles to continue to deliver the highest standard of patient care to the people of Hampshire and the Isle of Wight.